Not yet recorded from the UK but a possible immigrant as temperature rise due to climate change progresses, Amanita caesarea is one of the largest of the amanitas, sometimes attaining a cap diameter of 18cm. In southern Europe and especially in the Mediterranean region the ‘Mushroom of the Caesars’ is collected in great numbers, the most valuable specimens being those picked, volva and all, while still at the ‘button stage’. Fairly common in southern Europe, Caesar's Mushroom is not known from Britain or Ireland, but with climate change it might soon be able to survive this far north. Very similar mushrooms are found in North America, and the one most often recorded is Amanita jacksonii (pictured immediately above). 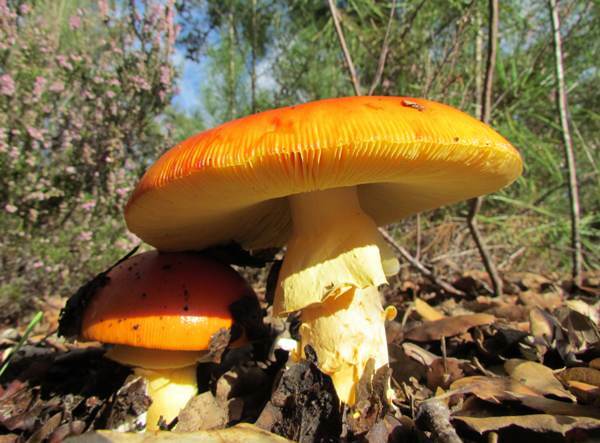 When young and fresh, the cap colour of Amanita jacksonii is a deeper orange (sometimes almost red) compared with that of Amanita caesarea, and its spores are much smaller. This mushroom was first described in 1772 by Giovanni Antonio Scopoli and was initially named Agaricus caesareus. (Most of the gilled mushrooms were included initially in the genus Agaricus!) 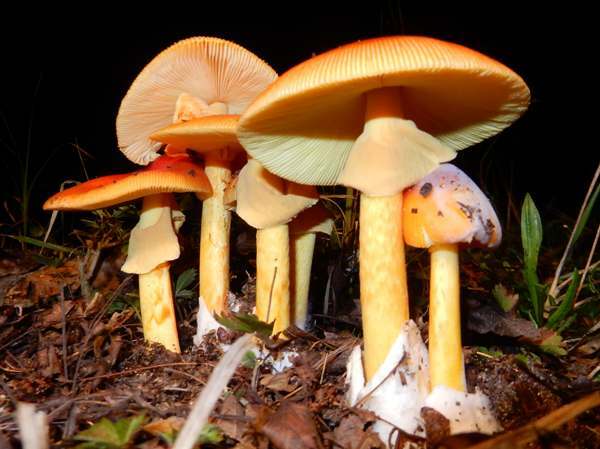 In 1801 Christiaan Hendrik Persoon transferred Caesar's Mushroom to the new genus Amanita, renaming it Amanita caesarea. 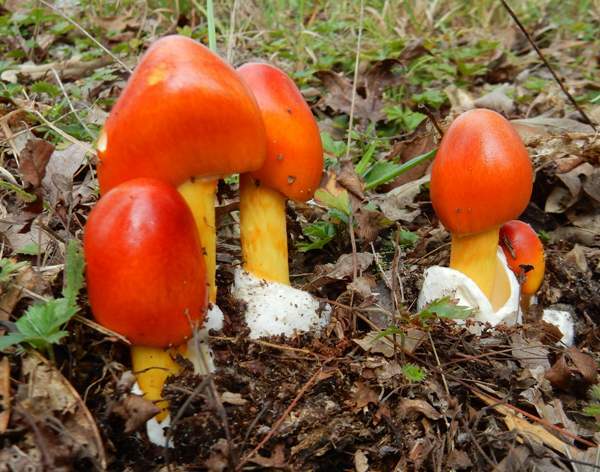 In Italy Amanita caesarea is a very popular edible mushroom and has been so for more than 2000 years. The early Roman Emperors, who to make history difficult all took the name Caesar, were very fond of this delicacy; this, of course, provided wonderful opportunities for dastardly deeds. Agrippina, wife (certainly not the first, but definitely the last!) of emperor Claudius, is believed to have plotted to poison her husband by including the deadly Amanita phalloides in a meal of Caesar's Mushrooms, because she wanted Nero, her son by an earlier marriage, to take over the imperial throne. Agrippina had also involved Xenophon, the medic who was called to treat Claudius, in this conspiracy: the ailing emperor received a toxic 'medicine' rather than a purgative. This fiddling with the treatment finished off poor old Claudius, and Nero succeeded him as emperor. Emperor Nero is infamously reputed to have been fiddling (before the violin had been invented!) while Rome burned. 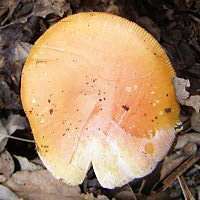 The caps of Amanita caesarea are orange, occasionally with irregular veil fragments but more often without; initially convex, flattening; 6 to 18cm across are with a striate margin. Finding a fully-expanded cap without at least one marginal split is unusual, as these warm-climate mushrooms tend to lose moisture content quite rapidly unless in deep shade. It is at the 'egg' stage that Caesar's Mushroom is most prized as an edible mushroom. The beautiful young cap shown on the left is closed by the stem ring, making an almost perfectly spherical sealed delicacy - but if you intend eating wildmushrooms do be aware that nearly all species must be well cooked before they are safe to eat. 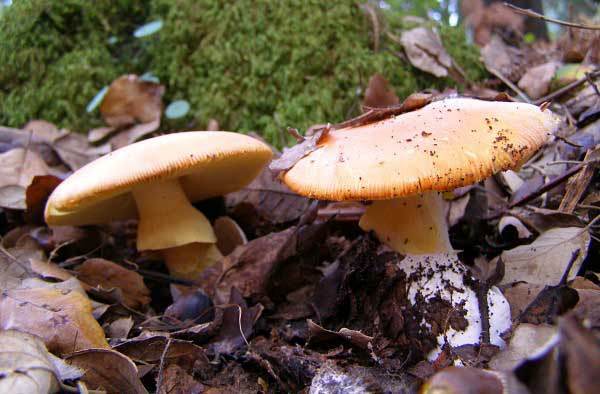 Some authorities report that Amanita caesarea is edible even in its uncooked state, but others counsel against eating them until they have been cooked thoroughly. 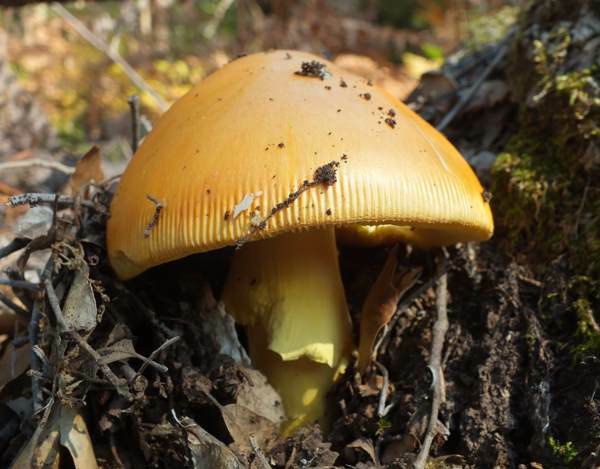 The gills of Caesar's Mushroom are yellow-orange, free and crowded. 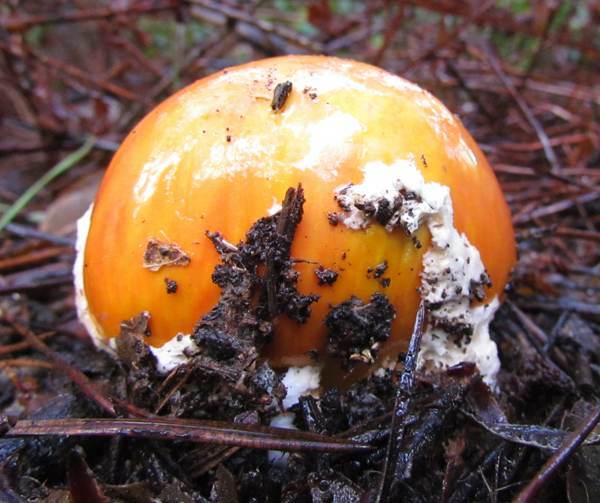 The stems of Amanita caesarea are pale to mid orange; often rough with attached veil fragments; large, pale orange ring; 5 to 12cm long, 1.5 to 2.5cm diameter; stem base is covered with a white bag-like volva. 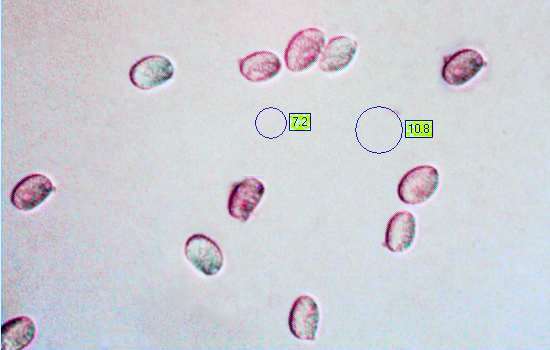 Ellipsoidal, 10–14 x 6–11µm; inamyloid. Not significant when tested in the field, although when cooked they are reputed to taste truly magnificent. 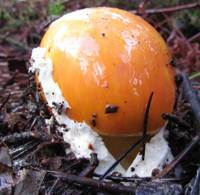 Amanita caesarea is an ectomycorrhizal fungus; it fruits under oaks in mixed woodland. 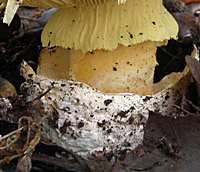 Amanita fulva has a tawny-orange cap and white gills; it lacks a stem ring. Amanita crocea is also orange but has a snakeskin-like pattern on its stem; this lovely mushroom also lacks a stem ring. The lovely mushrooms shown below were photographed in Virginia, USA; they are not Amanita caesarea (which has not been recorded north of Mexoco) but rather Amanita jacksonii, an American close relative of Caesar's Mushroom. 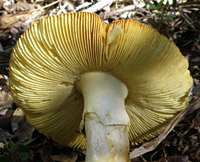 Above: Amanita jacksonii is a gregarious close relative of Amanita caesarea. Caesar's Mushroom is a highly-prized edible species and is most valued when at the 'button' stage. Currently we have no recipes of our own for this southern-European species, but in Italy and Cicily Caesar's Musrooms are known as Ovolo Buono and are simply sliced and rolled in salt before being seasoned with lemon juice, olive oil and a little pepper. Scopoli J A. (1772). Flora Carniolica exhibiens Plantas Carnioliae Indigenas et Distributas in - Classes, Genera, Species, Varietates ordine Linnaeano. Vol. 2. Vienna: Johann Paul Krauss. p. 419. Persoon C H. (1801). 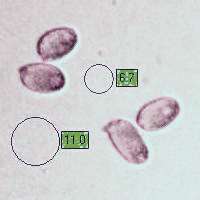 Synopsis Methodica Fungorum. Gottingae. p. 252. Carluccio A. (2003). The Complete Mushroom Book. Quadrille. pp. 23–24. ISBN 1-84400-040-0. This page includes pictures kindly contributed by Harold Seelig.